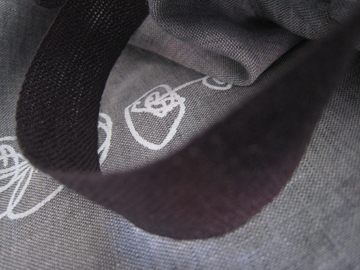 Mist grey Chambray linen gathered skirt with tie detail in Espresso Linen and White Screenprint detail. Latte froth, apple and cinnamon muffin smear, Hot Cross Bun remnants (my bun, her smeared remnants) apple juice, miscellaneous dirt, water, more water, more miscellaneous dirt, dinner smear. Gorgeous outfit - with or without the food I'm sure! so so so cute. really. she's gorgeous. And I love your description. I love most of your stuff, and I wish you would do more for adults. Especially midlife, graphic designer type adults like me? And I love your colourways. But of course I would, being a designer, and from Melboure. Can't help but wonder though, how you will manage when Pia wants pink, and nothing but pink! Thanks for the links, what a wonderful shop with so many many gorgeous things. Damn! Skirt and model are both gorgeous. If anyone can carry off hot cross bun smear it's Pia. cute model! love the white print on gray. I too love the white print on mist grey. And with the dark brown trim. Beautiful. Similar colours to the ones I'm working with for C's wardrobe at the moment too. what a cute little skirt! i really love the circle print. super cute! Stunning! It's a bugger how most of the food ends up on the clothes though isn't it.... No respect I tells ya. 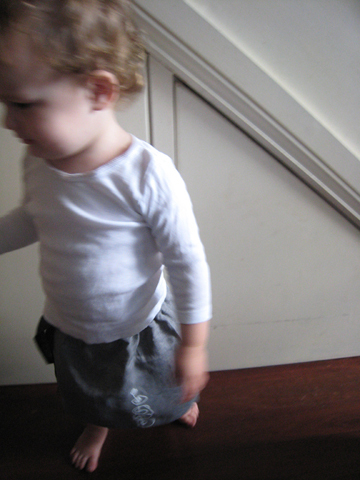 ah yes, and a lovely skirt too :) i love the contrasting linen + screenprint.